I just had the opportunity to review the most recent release; Another Mile, Another Minute; from Geoff Achison and it's quite good. 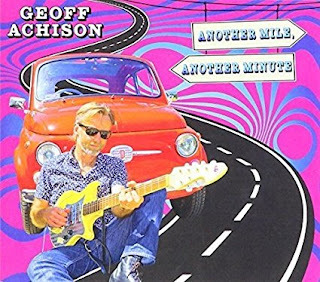 Opening with High Wire, Achison keeps the beat simple and with Richard Tankard on keys, Gerry Pantazis on drums and Roger McLachian on bass, lays down some real nice riffs on guitar backed by Susie Ahern on vocal. With it's reggae/pop feel, Working My Way Back Home has a real interesting sound, with a solid bass line, cool organ feel and colorful guitar work. Shuffle track, I'm Gonna Ride features cool harp work by Chris Wilson and pure rock riffs from Achison. An infectious bass line by McLachian on really sets off A New Bad Habit and Sax by Paul Williamson and trumpet by Jack Howard give it a great backdrop for Achison's cool, stylist vocals. Title track, Another Mile Another Minute has a smooth R&B feel with solid lead vocal by Achison and warm backing by Hannah Harwood, Steve Romig as well as the smooth horns of Williamson and Howard. Soul track, Dreaming I'm Awake is euphoric and has one of the most sensitive guitar solos on the release. Very nice. High stepper, Sum Peeples Got All Da Fonk is a playful track with a solid groove, and all the fixins for some funky music...organ, bass and drums. Very cool. Make My Stand is another track with a bouncy bottom but with the inclusion of slick slide work... a jazzier approach. Wrapping the release is acoustic number, Front Porch Farewell. With the precision of a surgeon, Achison finger picks his guitar country style by with the touch of a lullaby. A very nice closer for a cool release.